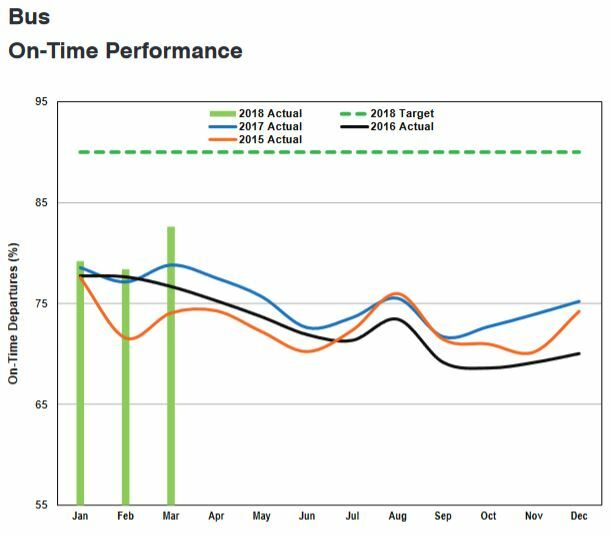 The TTC has posted a new report on its Customer Service page which displays the route-by-route on time departure scores for the past three years. Reports of this nature were promised in the “Customer Charter” but have been missing since the first quarter of 2015. There is no explanation of what these scores actually mean, although this can be gleaned from the comparable system wide-scores in the CEO’s Report. The overall values for the bus and streetcar systems (from the CEO’s Report) are shown below. 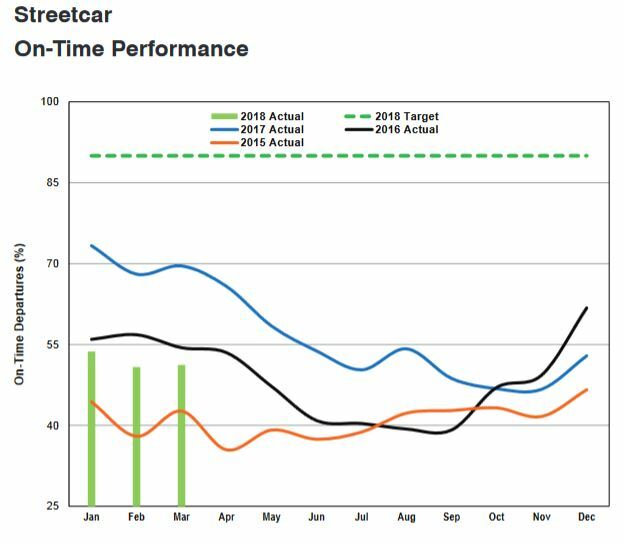 The bus system does somewhat better than the streetcars, but on time departures still sit in the 80 percent range, and trends for the past three years follow a similar pattern. For the streetcars, barely half of the service is “on time”. The real problem for both modes is the definition of what is measured, where this is taken, and over what period. When there is a six-minute window in which a vehicle is considered to be on time, but when the scheduled gap between cars anywhere below about 9 minutes, then pairs of vehicles can operate across a route and still count as “on time”. For example, if departures are scheduled at 12:00 and 12:09, but the actual times are 12:05 and 12:08 (one five minute late, the other 1 minute early), it does not take long for this to coalesce into a pair of vehicles. For a 6 minute headway, the pair can leave a terminal together and be “on time”. That the TTC cannot achieve better stats even with such a generous metric for streetcar lines which tend to have frequent service is a bad starting point. The next problem is that this measure is taken on an all-day basis and only at terminals. There is no breakdown of whether service is more or less “on time” during peak periods, midday, evening or weekends, not to mention that service once vehicles leave a terminal can be nothing like the terminal departures. This was shown in my recent analyses of service on 505 Dundas and 505 Carlton bus operations, and there are similar problems throughout the system. Most riders do not actually board at the terminals, and so the gapping and bunching they experience is worse than that reflected in the official stats. Finally, “on time” is a meaningless metric for riders on frequent routes where the schedule per se is of little interest, only that a bus or streetcar appear “soon” and that there is room available when it does. The word “they” should never apply to transit vehicle arrivals, but this is all too common as every route analysis I have performed (many published here) show where bunching is common even on wider scheduled headways. The TTC has a proposal for reorganizing its bus service in The Junction and is seeking feedback for a report to the TTC Board this summer. 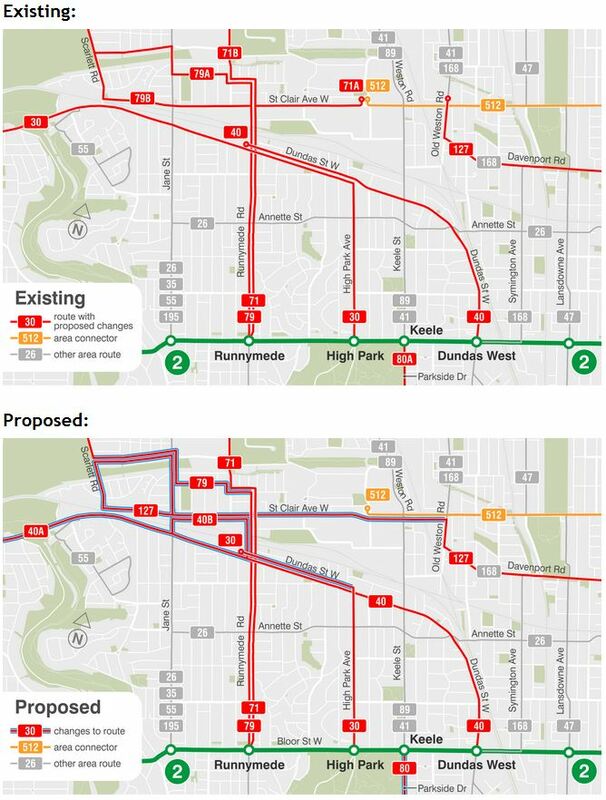 The maps below are clipped from the TTC’s site. On St. Clair, the 127 Davenport bus would be extended west from Old Weston Road to an on-street loop via Scarlett Road, Foxwell and Jane Streets. This would replace the 71A branch of Runnymede that now terminates at Gunn’s Loop as well as the 79B branch of Scarlett Road. All 71 Runnymede buses would run north up Runnymede, and all 79 Scarlett Road buses would follow the current 79A route via Foxwell and Pritchard. On Dundas, the 40 Junction bus would be extended west to Kipling Station replacing the 30 Lambton bus which would terminate at Runnymede Loop. A short turn 40B service would loop via Jane, St. Clair and Runnymede as another part of the replacement for the 79B Scarlett Road service. The 80B Queensway service that terminates at Humber Loop late evenings and Sundays would be eliminated and buses would operate to Keele Station via Parkside Drive at all times. This through service to the subway was in place during the reconstruction of the loop, but the 80B reappeared on April 1 using an on-street connection to the Queen car at Windermere/Ellis. There is no before/after service plan showing bus frequencies on the existing and planned routes. When the railway underpass at St. Clair and Keele closes for reconstruction and widening, this will shift the western terminus of 512 St. Clair to Earlscourt Loop (at Lansdowne), and the proposed 127 Davenport service through to Scarlett Road will not be possible. There is also no mention of the proposed 512 St. Clair extension to Jane Street which dates back to the Transit City days, but is for all practical purposes a dead issue. That extension was premised on the idea that streetcar service on St. Clair would operate from a carhouse to be shared by the Finch and Jane LRT routes. The Jane LRT is nowhere to be seen, and in any event would be a standard gauge line making its use by TTC gauge St. Clair cars impossible. Assuming that the Davenport bus is rerouted along St. Clair, this would remove service from Townsley Loop which has been in service since 1924. It would also eliminate the planned connection by the Davenport bus to the SmartTrack St. Clair/Keele station, although this transfer connection would remain possible at the Keele/Weston/St. Clair intersection. The June 24 schedule change brings a major upheaval to the streetcar routes and the usual round of summer service cutbacks. Streetcar service will, after a long absence, be restored west of Humber Loop. The new service design is similar to the pre-shutdown arrangement where a separate service, the old “507 Long Branch” in everything but name, will operate between Humber and Long Branch Loops. Late in the evening and overnight, streetcar service will run through from Neville to Long Branch. During the AM peak, five trips will operate through to downtown via Queen arriving at Yonge Street starting at 8:05 am and every 15 minutes after to 9:05. Midday service at 9 minutes will be slightly better than the 10-minute network would require because the dead-head time to and from Russell Carhouse for one car is not worth the effort. Recovery time for the “Long Branch” service will be scheduled at Humber Loop to maximize the overlap with the main service on 501 Queen for transfers between cars. With the completion of construction at Gerrard and Parliament, the 65 Parliament and 506 Carlton routes return to normal through this location. However, the 506 Carlton will divert a bit further east (see below). The track on Broadview from Dundas to Gerrard, including both intersections, will be rebuilt over the summer months. This affects many routes. 504A streetcars will operate from Dundas West Station to Distillery Loop. This will be scheduled entirely with low-floor cars to preserve accessibility on Cherry Street. Note that the ramps will not be deployed on Roncesvalles because the “bump out” stops are incompatible with the ramps. This problem will be fixed in 2019 while streetcar service is removed from Roncesvalles for the intersection reconstruction at Queen Street. 504B/C streetcars will operate from Dufferin Loop to Bingham Loop (weekdays daytime) and to Woodbine Loop (evenings and weekends). This service will use CLRVs. 504D buses will operate from Broadview Station to King & Parliament. Overnight service will operate with a 304 streetcar service from Dundas West Station to Woodbine Loop, and a bus service from King & University to Broadview Station. The streetcar service will be scheduled to use low-floor cars. With the shuffling of buses between routes, the 502 Downtowner peak period service will revert to streetcar operation for the summer using CLRVs. 504D King bus: From Broadview Station south to Gerrard, west to River, south to King, west to Parliament looping via Parliament, Front and Berkeley. 505 Dundas bus: From Broadview Station south to Gerrard, west to River, south to Dundas. 506 Carlton bus: No diversion. 504D King bus: From Broadview Station south to Jack Layton Way, then west and south via St. Matthews Road to Gerrard, and west via the River Street diversion as above. 505 Dundas bus: Same diversion as 504D King to bypass the intersection at Gerrard. 506 Carlton bus: Via River, Dundas and Logan both ways. These diversions will add a lot of turning buses to the intersections at River & Gerrard, and River & Dundas. One can only hope that the City Transportation Department will adjust the traffic signals to suit this arrangement. Construction continues at Main Station, but new work by Hydro has further affected routes in this area, and diversion routes around work on Main will be implemented as needed through the summer. The 87 Cosburn and 64 Main routes will be interlined. On weekends, 64 Main buses will divert northbound via Kingston Road and Woodbine to Danforth on weekends due to City road construction. Due to maintenance work at Greenwood Carhouse, movements to and from the yard will be reduced during the daytime weekdays. Four peak trains that normally return to Greenwood between the rush hours will instead use Keele Yard. Paving work at Lawrence West Station will prevent buses from using it as a terminus. The 52G Lawrence to Martin Grove service will be extended east to Yonge Street, along with the 59 Maple Leaf route. 109 Ranee buses will serve the station from the street. The 29 Dufferin bus will not operate into Exhibition Place during the summer because of many events that block roadways. All service will terminate at Dufferin Loop. The 30 Lambton bus will be extended into High Park on weekends. The 121 Fort York–Esplanade bus will be extended to Ontario Place. Evening service will be improved on 509 Harbourfront and all recovery time will be scheduled at Exhibition Loop to avoid delays at Union Station. The 83 Jones bus service will be improved off-peak to provide more frequent access to Leslie Barns as the infrequent evening and weekend operation interferes with operator access and crew changes. There is a particular irony to better service on this route. In 1972, a group of local residents forced the TTC to hold its Board meetings in public as required under the Municipal Act with the intent of making a deputation asking for a bus on Jones Avenue. This was the beginning of open meetings at the TTC, a residents’ group lobbying for a route the TTC did not want to run. A new route, 176 Mimico GO, will operate between the Lakeshore/Park Lawn area and Mimico GO Station during peak periods on a 30 minute headway to improve access to the GO service.